Not since the 2005 Peter Jackson blockbuster film starring Naomi Watts and Adrian Brody has the famous King Kong story caused such a stir as the latest pokies game from NextGen Gaming. This five reel, 25 payline video pokies game recreates the classic 1933 tale of the colossal sized gorilla who goes on a rampage from Skull Island to New York City. The game features all the iconic imagery associated with King Kong, executed in sophisticated NextGen style. A suspenseful soundtrack and dramatic sound effects help add to the atmosphere, so play with your speakers on or headphones in to enjoy the full impact of this beautifully designed pokies game. 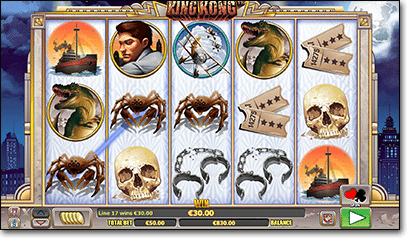 No skill or strategy is required to play King Kong, making it suitable for newbies as well as seasoned online pokies players. The game is available for free play in practice mode at our recommended casinos, while signing up for an account to play for real money bets is quick, safe and easy. Once you’ve made your deposit, load King Kong and customise your bet using the up and down arrows next to the coin icon on the bottom left hand corner of the reels. 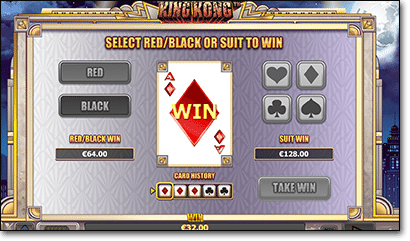 King Kong comes with a minimum bet of $0.25 and a maximum bet of $50.00 per spin. You can also automatically play up to 100 spins using the auto-play feature. Gamble feature – the gamble feature becomes available after every winning spin, giving you the choice to double your winnings by guessing whether a face-down card will be black or red. You can also place an additional wager on what the suit of the card will be. Guess correctly and you’ll win extra and have the choice to guess again, but get it wrong and you’ll lose your winnings. Wild symbol – the wild is the King Kong gorilla symbol which appeals on reels two, three and four and substitutes all other symbols to create a winning combination except for the scatter. Scatter symbol – the scatter is the King Kong logo, and an appearance of two or more across a winning payline will award a multiplier based on your original bet. Land five scatters in a winning combination to receive up to 2500 coins. King Kong Ape Bonus – the King Kong Goes Ape feature is triggered by the appearance of the wild symbol anywhere on reel three. When this happens, all symbols on reel three become wilds, with the possibility of extra wilds appearing on reels two and four for some epic wins. All free spins are played at the rate of your current active bet and can be re-triggered during the free spins bonus. While NextGen and the NYX Gaming Group have a solid reputation for providing some of the leading pokies on the Internet, you’ll only find NextGen games at a handful of our recommended casino sites. Some region blocking has seen NextGen/NYX games restricted from Aussie-friendly casinos in the past, but we’re happy to see these impressive games, along with King Kong, available for real money bets at the top online casinos recommended in our casino table above. These three casinos are all available in instant-play, which means you can play King Kong directly over your web browser with no need to make any downloads. Safe deposits are available in AUD using trusted payment methods like Visa, MasterCard, Neteller, Skrill, Paysafecard and bank transfers. Join using our links and you’ll be welcomed with matched deposits and free spins upon depositing real money to your account for the first time. King Kong is a solid pokies game that has it all – crisp graphics, affordable wagers and multiple bonus features, so it definitely gets a big thumbs up in our books. We love that the King Kong Smash Bonus provides a mini-game, and when that wild bonus hits and Kong goes ape you’ll feel like you’ve really hit the big time. Overall, this is a great game for Aussie players. Sign up to play King Kong at Slots Million today and receive up to $100 in bonus money plus 100 free spins to use on NetEnt’s most popular pokies games.